This was pure Wexford, one of those classic hometown entertainment shows which have become almost routine under the stewardship of Davy Fitzgerald. A crowd giddy with excitement swarmed the pitch at the end to hail a famous victory in the quarter-finals of the National League. Out of a scrum of admiring followers emerged Fitzgerald, another one down, another feather in his cap. They took out the reigning league champions and, of course, the All-Ireland title holders, who had blitzed them in the second half of last year's Leinster final. That day brought a measure of realism to the Wexford resurrection which began on Fitzgerald's heavily-publicised appointment. In that sense, yesterday had a deeper meaning and relevance. The match had a pulsating finish. A minute into injury time Conor Whelan scored his fifth point in an outstanding individual performance to leave Galway, who had to deal with the loss of Jack Coyne to a straight red card after an off-the-ball incident in the 52nd minute, within a point of the home team. Two points down when Coyne was sent off, Galway dug in and were level through Whelan on the hour mark, but teenager Rory O'Connor, who was exceptional, struck a huge point in immediate response and Galway trailed from there to the finish. What a finish it was. After Whelan's final point in injury time, Conor McDonald, the game's only goalscorer shortly before half-time, hit two points which raised the rafters and saw Wexford safely into the semi-finals. They face their close rivals Kilkenny at 4pm next Saturday, at Wexford Park once again. It will be a third competitive meeting between the counties this year and their fifth in the last 12 months. Wexford have been beaten just once in the previous four. "I don't care," said Fitzgerald when asked about that prospect. "I just want to be in the competition. I value the competition. It's a national competition. We're playing Kilkenny down here. We'll have 8-10,000 people here. There will be an unbelievable atmosphere. You've seen the atmosphere today - why wouldn't you want it? If we have it again next week, fine. "We know we'll meet them in mid-June and we know that will be helter-skelter. But that will be completely different to the conditions now. That's why the league and championship is great because it's totally different." 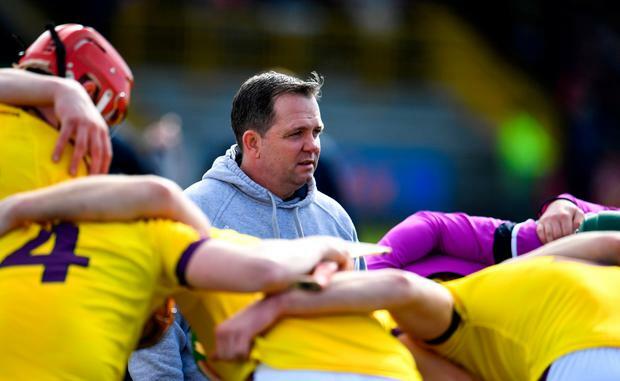 Beating Galway was another statement of intent by Wexford. Wexford defeated Galway in Salthill last year on their way to winning promotion from Division 1B. But in the championship there was a marked differential. Yesterday did not disprove that a differential still exists, it being March and heavy ground, but Wexford are a more formidable side this year heading into the summer. Galway have work to do. They were below their best, hurling in fits. At times they showed the class that remains in the team, just didn't sustain it. But there were some positive contributions from Whelan, Johnny Coen and Cathal Mannion who weighed in with quality scores. Wexford lost Damien Reck early in the match, having helped DCU to win a Freshers title during the previous week, and Willie Devereux had trouble coping with Whelan's power and finishing in Reck's absence. Wexford got more from their team, although Galway were still well in the match entering the final moments, even with the numerical disadvantage. "I am delighted with the win," admitted Fitzgerald. "We won it when it was in the melting pot but I think we shouldn't have put ourselves in that position. I think Galway will be a different proposition in two months' time, they will be a lot different, but I would hope that we will be a lot different as well. We have to cut out the errors." He referenced five missed frees in the first half, with Lee Chin scoring his first to answer an opening score from Coen, but then wayward with the next two from around 45m. Rory O'Connor took over and scored three without fail, then missed two and Paudie Foley was also off-target with one effort. Foley had a huge game, scoring five points, including two from play. If there is work to be done, there was no issue with the team's attitude. "You can't ask for anything more," said Fitzgerald. "Like you can see what it means to the people. They love their hurling down here. And it's a great place to come to, to be at a game." Wexford took a one-point lead to the half-time break, 1-9 to 0-11, which should have been greater. But they were always in Galway's faces. Jack O'Connor epitomised their spirit by fielding four puck-outs in the first half, the first three under the guard of Aidan Harte. Padraig Mannion was later moved on to him and had more success. O'Connor had a hand in their goal as well. His quick lineball was snapped up by Paul Morris who moved it on to Rory O'Connor. His strike was parried by James Skehill and McDonald finished the rebound. Joe Canning started but didn't sparkle, moving from midfield to full-forward and not having major influence outside of his free-taking. 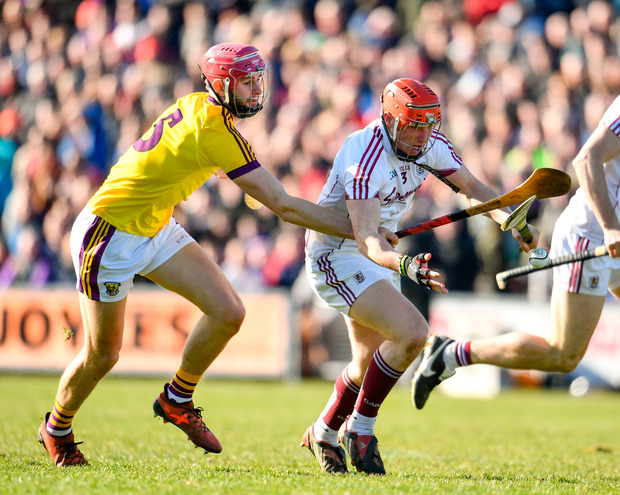 Galway restarted the match after half-time better and regained the lead but Wexford's response after conceding the first three points was to score the next four. Typical of their defiance on the day. Scorers - Wexford: R O'Connor 0-6 (4fs); C McDonald 1-2; P Foley 0-5 (3fs), D O'Keeffe 0-3, K Foley, L Chin (1f) 0-2 each, J O'Connor, L Ryan, H Kehoe 0-1 each. 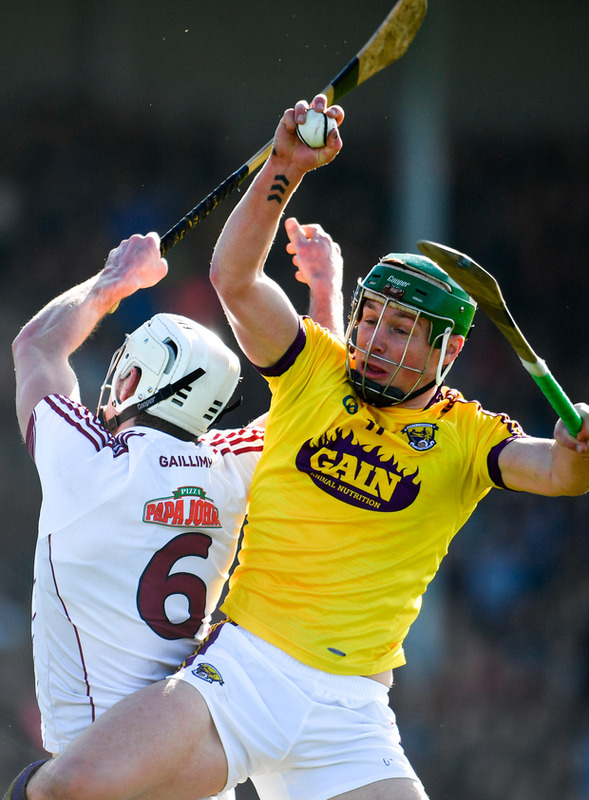 Galway: J Canning 0-10 (9fs, 1 65); C Whelan 0-5, C Mannion, J Coen 0-3, J Cooney, J Flynn 0-1. Wexford: M Fanning; D Reck, L Ryan, S Donohoe; D O'Keeffe, M O'Hanlon, P Foley; K Foley, R O'Connor; J O'Connor, D Dunne, L Chin; S Murphy, C McDonald, P Morris. Subs: W Devereux for Reck (inj 14 mins); A Nolan for Dunne (53); H Kehoe and C Dunbar for J O'Connor and Morris (69). Galway: J Skehill; A Tuohey, J Hanbury, P Mannion; J Grealish, G McInerney, A Harte; J Coen, J Canning; J Cooney, J Coyne; C Whelan, C Cooney, D Burke. Subs: S Loftus for Grealish (half-time); J Flynn for Burke (57); B Colcannon for Cooney (69).